A movie filming in Georgetown will cause road closures on Wednesday and Thursday. While D.C. Police Traffic could not confirm with WTOP the filming of Wonder Woman 2 in Georgetown, Twitter is abuzz with the scoop. WASHINGTON — D.C.’s making it on the big screen. 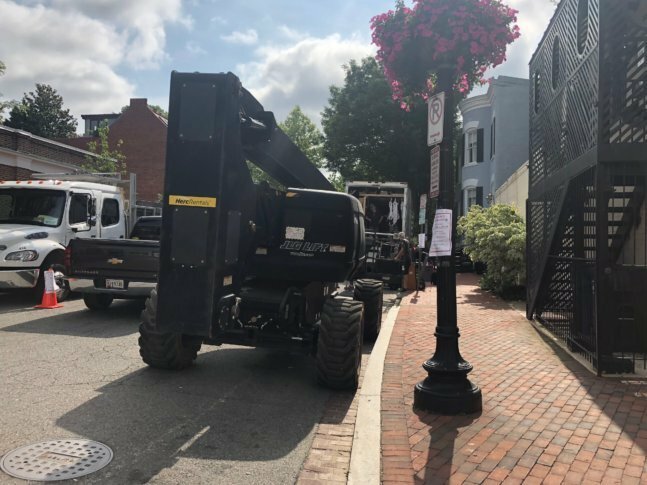 A movie filming in Georgetown will cause road closures on Wednesday and Thursday. Wisconsin Avenue NW will be closed from M Street to K Street from 9:30 a.m. to 3:30 p.m. Wednesday. On Thursday, there will be intermittent road closures from 6:30 a.m. to 8 p.m. on Wisconsin Avenue NW from M Street to P Street. Drivers should follow police direction for alternate routes. While D.C. Police Traffic could not confirm with WTOP the filming of “Wonder Woman 2” in Georgetown, Twitter is abuzz with the scoop. Even movie director Patty Jenkins shared some photos from the movie. An empty storefront in my old work neighborhood just got converted into a Commander Salamander, a defunct store chain from my misspent youth circa 1984. Also, #WonderWoman2 is filming in DC soon.